I’ve been tinkering with PuzzleScript on and off for a few months now, but over the last few days I’ve put together a complete game with it, which you can play here (source here). 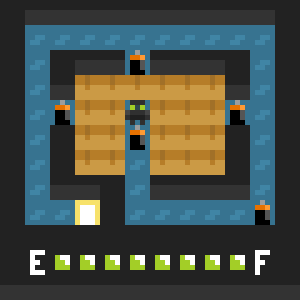 It’s a Sokoban variant (which is what PuzzleScript is best at after all), based around having an ever-depleting stock of moves, which can be replenished by collecting batteries – which also act in the same way as crates (i.e. pushing crates that are pushed at them, and blocking crates from being pushed through them). I wanted to make a game that got around PuzzleScript’s inability to keep count of integer variables in an inventive way (the energy gauge is physically represented in the world), and that could be played with the restart, undo and action buttons disabled (although of course within minutes of releasing it someone asked for a restart button). Give it a go and let me know what you think!